Would you like your experience at airports to be smoother? It can be with the right carry-on luggage. Your best travel companion. Whether you are constantly traveling for work or leisure, having reliable carry-on luggage can certainly improve your travel experience. Having the best carry on luggage means less hassle when passing through security checks and makes accessing your things a breeze. But just like with any travel accessory, not all luggage carry-ons are created equal. Therefore, it’s vital that you do your research well and make sure you choose something that meets the carry-on requirements. It is also important to make sure it is suitable for your travel lifestyle. The type of carry-on suitcase that you use has probably contributed to the many complaints you have lodged against air travel. For instance, carry-on luggage that’s not equipped with a dedicated laptop protection carrier might lead to damages to your laptop during security screening. This can inevitably lead to frustration, especially if you’re traveling for a meeting or conference where you need to use your laptop for a presentation. You should choose the type of carry-on luggage that allows you to store your business essentials safely, make you look sharp, and makes traveling a breeze without having to worry about the international or domestic carry-on standards imposed by the TSA. One of the best airline carry-on bags is the travel backpack. A carry-on bag is manufactured by outdoor companies and is available in a wide variety of sizes, ideal for all types of travelers. Traveling with a carry-on backpack is truly convenient since you can simply hang it on your back and you will still have both hands free. It’s much easier to move around instead of having to pull a wheeled luggage. One of the major downsides of having a backpack as your carry-on is that you’ll end up carrying the entire weight of your things on your back. Even if you are bringing carry-ons that are within the weight limit set by the airline, having that much weight on your back can still get uncomfortable over time. If you’re suffering from some back problems, carrying a backpack as a carry-on is not a good option for you. There are certain restrictions and an important one being the carry-on size. The standard maximum carry-on dimensions for carry-on baggage are 9 cubic inches x 14 inches x 22 inches (22 cm x 35 cm x 56 cm), including handles and wheels. In the past few years, we have been recommending the use of two-wheeled luggage instead of the spinner luggage that has four wheels. This was based on the feedback that we received from frequent flyers and interviews done with luggage designers. However, after performing extensive testing and with the improvements done on the materials and design, we are now questioning this recommendation. We still believe that a two-wheeled luggage is an excellent choice and that these types of luggage have more internal space. However, after several years of traveling using both types of carry-on bags while overcrowded flights in busy airports, we cannot deny the fact that it’s far easier to navigate your way through airports using a four-wheeled luggage. It’s because of this that most travelers choose the four-wheeled luggage instead of the usual two-wheel luggage. As stated by Jason Gifford, the design manager for e-Bags, 90% of the total luggage sales in 2017 belonged to the four-wheel spinner models. With a spinner carry-on luggage, you can conveniently push the bag ahead of you as you walk, or perhaps run it on your side or drag the luggage right behind you. You are free to decide which bag works best for you, given the type of traveler that you are and depending on the situation. What’s more, the wheels of most of the four-wheeled luggage are easily replaceable, just in case one of them breaks. On the other hand, the only maneuverability benefits of having a two-wheeled luggage are better ground clearance on rough terrains, especially when walking through cobblestone streets, and ease of rolling on carpeted floors. What we love about this carry-on is the fact that it comes with several travel-friendly features. Aside from having four spinning wheels, which makes navigating through busy airports more convenient, it also has a side handle, which makes placing it in the overhead bin much easier. This luggage bag’s biggest clientele is perhaps people who hate the idea of storing their large luggage in their room after traveling or constantly tripping on their massive luggage inside the hotel room. Thus, the biggest selling point of Contempo is that it can be collapsed to half its overall size. Therefore, you can simply roll this foldable luggage under your bed when not traveling, which will save you a lot of space. You can even stash it in hotel closets, to avoid tripping over it! Furthermore, the bag has plenty of storage space and comes with an elastic strap, a zippered pocket, as well as two mesh compartments with zipper. If you are one of those travelers who tend to sit or jump into the contents of your luggage before closing it and may still have to take out some things, then this luggage is a good option for you. Although it has a basic design and is not as stylish as the two previous bags on this list, there are lots of great things that you’ll love about this luggage. For one, it comes with a compression system that allows you to pack up to 33% more stuff and still bring it back to the allowed size limit for carry-ons. As for the interior, each side comes with mesh panels for storing garment and is said to help minimize wrinkling. Therefore, this bag is perfect for business travelers who want to be able to don their suits for meetings without having to spend any time ironing them. This luggage comes from the same company that used to make Swiss army watches, and this is why the look reminds you of the iconic pocket watch. The luggage consists of a total of eight wheels since each base corner has dual sided wheels. With this feature, you can conveniently spin the bag up to 360-degrees, which is very useful when you need to wheel it down into the narrow aisle of the plane without having to hit every row of the seats while passing through. The bag features a polycarbonate exterior and comes with a universal tracking number, plus a 24-hour customer service support line, just in case the bag gets lost. Even the extra-capacity version of this bag, which is about 1.5 inches deeper and wider, meets most of the rules applied on luggage carry-ons. This luggage bag comes with four dual wheels and the MagnaTrac technology, a feature that makes use of magnets in aligning the luggage wheels and helps keep the wheels moving to the exact direction that you want them to move. 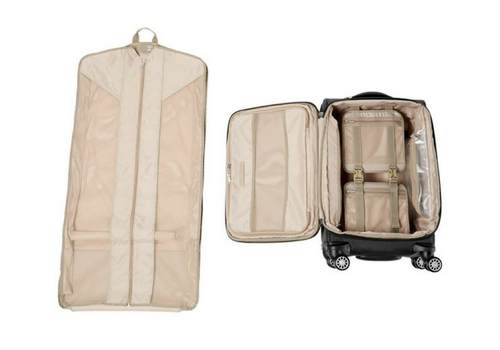 Comes with a travel garment bag, which is great for delicate clothing such as suits. With a contoured grip on the bag’s handle, shoulder strain will be greatly minimized. Furthermore, the luggage comes with sealed ball bearings similar to in-line skate wheels. The Lipault is a compact carry-on luggage made from an ultra-lightweight material, which makes navigating through the airport very easy. This four-wheeled carry-on is made from heavy grade nylon material that can hold up well enough to even the most basic travel perils, like water and scuffs. Its size makes fitting it to overhead bins very easy. Made by a popular luggage maker, Genius Pack, this luggage bag caters to those who tend to have a personal organizer with them while they pack. Everything inside the bag has its place, and if you’re a techie, you will love this luggage even more. It has a labeled compartment to accommodate certain gadgets and devices, including a portable battery pack that you can use for recharging while in transit. Perhaps, the best feature of the bag is the laundry chute. It’s a sack style compartment that’s ideal for storing used clothes. The compartment compresses your used clothing into the bag’s inner wall and zips it out when you need to take them off for washing. This hard-sided luggage is known for being waterproof, lightweight, unbreakable and scratch-resistant. It’s made from 100% polycarbonate shell, which allows for extra durability, flexibility, and strength. The compartments inside are nicely organized and spacious and come with compression straps that help prevent shifting. It also has a nylon laundry bag for used clothing. During the rough and tumble test done by Consumer Reports a few years ago, the original Alpha luggage bag of Tumi won many points for being spacious and durable. This recent model ups the ante further, thanks to its 360-degree wheels and artfully rendered bumper guards. Moreover, it comes with more user-friendly interior pockets with straps, as well as a tie-down strap that helps to compress more clothes in a mesh. This boxy airline luggage bag features five compartments that include zip-closed and removable color-coded compartments. Vertical packing cubes. They stack well enough and slide out like tiny drawers so you can choose to store sock in one compartment and perhaps, shirts in another compartment. The frame is made from aluminum alloy and designed in such a way that the bag can also be used as seating for when waiting for a long time at the airport gate. You also have the option to attach flashing LED lights on wheels. The Rimowa luggage is made of hard cases and is available in different colors that look very stylish, from metallic ice blue, black, red, and violet. In this list of the best carry-on luggage, this bag is the lightest. We also love it because of its no-brainer feature – the telescoping handle, which is capable of locking the bag to any height positions, instead of merely limiting you to only two positions. Moreover, the bag’s four-sided wheels allow you to enjoy a 360-degree movement, which makes it easier to move around. Each half of the luggage’s case interior also comes with a zippered mesh compartment. Starting at $245, The Away Bigger Carry-On luggage is our top traveler’s choice. The sleek, modern design makes it very lightweight and extremely easy to roll. This four-wheeled carry on has the highest quality wheels that money can buy. It seriously glides with the slightest push making it extremely easy to get around at an airport. The polycarbonate shell can handle an enormous amount of use that bends under pressure. This Away Carry-On and Bigger Carry-On is considered “smart luggage“ because it has an ejectable battery that can charge your phone or any other tech gadget. There are other smart luggage that are restricted carry-on bags because the battery does not eject, meaning it can not separate from luggage. Other features that make this luggage stand out is the TSA-approved combination lock, interior compression system so you can pack more, and a hidden laundry bag to contain your dirty clothes. The latest features of the carry-on luggage of today, as well as their ease of use, will amaze you. Even hard sided luggage carry-ons make accessing your travel essentials so easy now, allowing you to pass through security checks conveniently. Thanks to the retractable handles and heavy-duty roller wheels, most luggage bags are now easier to maneuver. The best luggage carry-on overall is one that has all these features such as the Away Carry-On. The second choice is the Biaggi Contempo Four-Wheel Spinner. In fact, these bags have everything that a frequent traveler would need for a stress-free trip. It has a spacious interior and can be easily put away for secure storage in your hotel room.